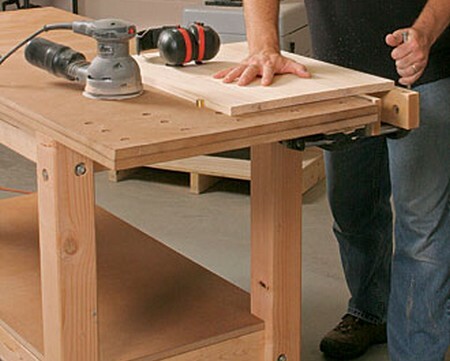 Build your workbench to help keep your daily tasks in order. Design your work bench to suit your individual needs and preferences. Decide what your optimal workbench height is. You can even set up a makeshift workbench to help you determine what height better suits your personal needs. You can do this before you make your permanent workbench. Do a few simple things on your make shift bench. This can help you make an informed decision. You want to ensure that your workbench has all the flexibility you need. The most beneficial heigh for you to work from may change from task to task. There are a few ways you can address this issue. You can compensate for the height difference with a foot stool that you can store underneath your workbench. However, resolving the height issue this way may not be the most solid way to work out. There may be a more sturdy solution available. You could opt to construct your workbench with the ability to adjust different sections. Your tools and equipment should be stored in other places besides the workbench. There may be certain tools that you use more frequently than others and want to keep close to you. Small drawers and bins for hardware such as screws, nuts, bolts and washers can be stored close. You can install drawers directly beneath the workbench. These are the perfect ways to store things. Besides the height factor, another important aspect of building this workbench is how sturdy it will be. This concept applies to the frame and the work surface. Ordinary 2 x 4 lumber secured with carriage bolts will give the workbench a good frame. You may have the idea to cut corners by using a sheet of ½ inch plywood cut to size alone. This is a very weak structure and you will only regret not building a sturdier structure. You should opt for stronger material like 2 x 6, 2 x 8, or 2 x 10 lumber. Your work surface will be more stable. Building a workbench is a project with room for a good deal of creativity. Your likes and dislikes and projects you take on daily will help determine what your immediate needs are. These are the elements you should incorporate into your work bench. preferences and the kinds of projects you’re likely to tackle will determine the features you’ll want to incorporate into it. You will need to think and plan your project out very well and execute the plan. You can design your workbench to be the ultimate workbench. You can also add new elements to your workbench as you feel the need arises.